Kerry Hammond is here to tell us about the latest book in a very long running Bed-and-Breakfast mystery series by Mary Daheim. 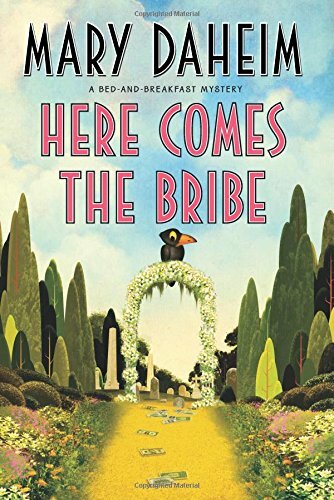 Here Comes the Bribe is the 30th book in the Bed-and-Breakfast mystery series by Mary Daheim. Just to be clear, I did not add a zero to that, it is really the thirtieth book in the series. The book was published in hardcover on April 5, 2016, by William and Morrow. I have to confess that I haven’t read any of the books in this series, but I have read and enjoyed several books in the author’s Alpine mystery series. When I saw that this was book 30, I just had to read it. For a series to hit #30, it’s just got to be good. Judith Flynn is the proprietress of Hillside Manor, a Bed-and-Breakfast that has seen its fair share of dead bodies. 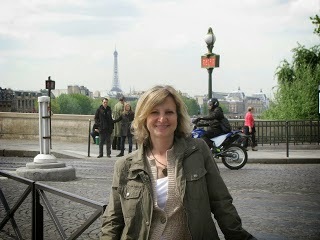 She runs it with the help of her husband Joe, and with input from her crazy cousin and cohort Renie. Her latest group of guests is in town for a wedding. The bride, groom and their group of strange guests are all staying at the Hillside Manor. The wedding is derailed when one of the guests is found dead in the garden and the police determine it was murder. To add insult to injury, the dead woman’s husband, who also happens to be the father of the bride, is claiming to be Judith’s long lost birth son. Since Judith does not recall having another pregnancy, he’s clearly delusional, but no one is quite sure what his angle is. Judith does a little snooping, accompanied by a little investigation, and attempts to arrive at the truth of both the murder and the fake maternity claim. The book was a real page-turner. From the very beginning, things seemed off with the B&B guests. Little pieces of information just didn’t add up and I needed to know what they were all up to. The plot was paced well and information was doled out in a timely fashion to not only keep it interesting but to keep it fair and allow the reader a chance at solving the mystery. I’m not saying I actually solved it, of course, but I was at least given the chance. Full disclosure, I was a little worried that jumping into a series with book 30 would put me slightly behind with the characters. I’m sure that a lot has happened throughout the years, but I have to say that I did not at all feel like I had been left out. The book really stood on its own two feet, the characters were immediately familiar, and I didn’t feel like there were inside jokes to which I was not privy. That is quite a feat for any author to pull off. Well done.